AUTO Keypad Lock, Dual Band, Dual Display and Dual Standby. Today in our editorial office has arrived the BaoFeng UV-5R transceiver. It’s time then to throw two lines down and tell you what we think. To begin I want to say now that making a comparison between the new BaoFeng UV-5R with the previous UV-R3 seems useless. The new device is a completely new device and completely detached from the previous one, it would make sense to make a comparison with a Wouxun or a Quansheng. Within the box we find the transceiver, a 1800mAH lithium ion battery, a clip to attach the device to the belt, a separate battery charger, dual-band antenna, a pair of headphones, a strap wrist and manual. The manual says that the battery is not charged when it comes home and is charged for 5 hours. In fact, the LED turned green after just two hours, indicating that the battery was already partially charged. The first thing we had to do was to enter the menu and set the spacing between 12.5KHz channels in VHF and 6.25kHz on UHF. Simple for those who have already had to deal with this type of equipment. BaoFeng UV-5R: Check The Price On Amazon! So we have programmed it according to the american repeaters, even this is a fairly simple task for the workmen, but still widely explained in the manual. We are rarely used to programming frequencies in memory, because we are used to using only a few frequencies, which are easily plugged through the front keypad. Unfortunately in this sense we had little problems with the BaoFeng UV-5R, for example on the 12.5KHz channel it was impossible to enter frequency 144.5125. On any other device you only need to enter “144.512”, while the final 5 is inserted automatically. The BaoFeng instead sets the frequency to 144,500 when you press the Up key to increase the 12.5KHz frequency. The same problem is detected on UHF, unfortunately. Programming memory frequencies is also not a simple task, because the correct procedure, oddly, is not indicated in the manual! We immediately found out that to access menu 28 we had to erase the old memories. In addition, only visible frequencies in VFO A can be programmed. Normally you can program a repeater by setting all the necessary parameters and writing them into the device memory. With the UV-R5 you have to program it twice in the same memory: first the reception frequency and then the transmission frequency. In a sense, this may be strange (and indeed a little bit), but this system also allows for greater flexibility. The audio of the unit is excellent, both in transmission and in reception. The sensitivity is on excellent levels and in contrast to the UV-R3 this UV-R5 is capable of handling strong out-of-band signals. The BaoFeng UV-5R Transceiver is made of excellent materials, provides excellent performance thanks to a high quality antenna, ergonomics is good, although sometimes we have run out of FM radio button instead of PTT. A good appliance, distinguished from its predecessor, and recommended to amateur radio enthusiasts. 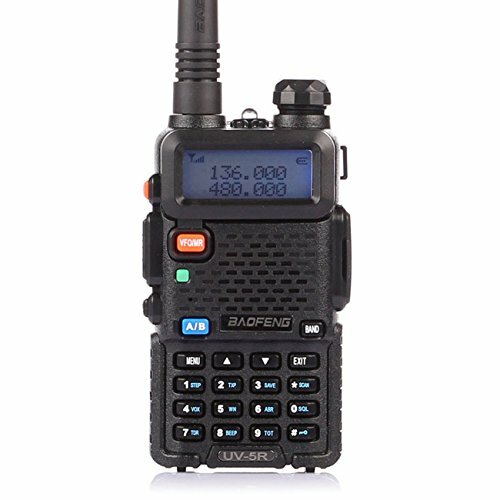 BaoFeng UV-5R: Click Here To Purchase On Amazon!